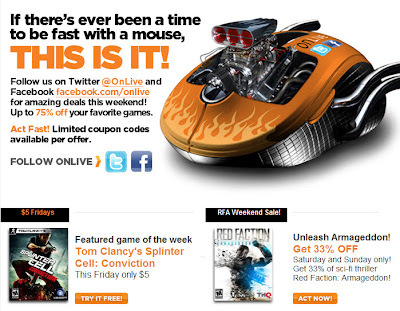 If you follow @OnLive on Twitter and OnLive on Facebook you have the chance of getting a 75% off coupon code for a game of your choice. Red Faction Armageddon is also off 33% from $49.99 to 33.49$. Total is well known, The villain (thieves) Linden is a popular entourage, few people took him, but you know what? If you did not use for a long time Lyndon words,coupon code on diabloiiigold when you close to the entourage camp, he always can not wait to ask you to ask him to join.